Just a few months ago, I have to admit that I didn’t know a single band from Chile. And in just one week I have a release from a second band from this country, with a different approach from the first one to our beloved music. The band was in the minds of the duet from, 2004/2005 when Claudio was playing with his former band, POEMA ARCANUS and Felipe being one of their roadies. They started sending e-mails with ideas about this doom project and when Felipe moved to Santiago, they started working more seriously on their compositions. They tried to find other musicians to complete the band lineup, but the lack of a traditional Doom Metal scene in Santiago, made them take the decision, to go on as a duet and call some friends to record the drums and the solos. The two songs in the "Solve et Coagula" EP (I’m ready to bet that it is about the fictional character and former member of DC Comic’s Doom Patrol, Kate Godwin) are two long compositions, over 10 minutes each. Staring with funeral bells and a dark melody from an acoustic guitar, you know what you are going to listen. 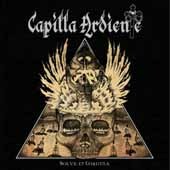 CAPILLA ARDIENTE (meaning "burning chapel" if I remember correctly) are following the trails that bands like CANDLEMASS and SOLITUDE AETURNUS left in the past and still leaving, without leaving aside the first metal band BLACK SABBATH. There are some parts, especially at the solos, that they have a more thrashy and heavy approach, something logical and in my opinion not bad since Quincy is not a musician from the Doom Metal scene. The production, for a self-released promo, is above average and matches the standards. "Solve et Coagula" is a very good release. CAPILLA ARDIENTE may not be the most innovative band, I would say the opposite, but for a reason you can feel and understand that they truly believe what they are doing and that they don’t give a damn if someone says any bad things about this EP. They do need to work hard, but this is not a bad EP. P.S. :The promo pack is limited to 30 copies - just for promotional reasons and for some friends of the band. High Roller Records released the vinyl version limited to 500 copies a month ago.